This frame has been personally signed by Bruins forward, Phil Esposito. Esposito played 18 years in the NHL as one of the top centremen in the game. Phil played 6 seasons with more than 100 points including a season that he average almost 2 points per game with 152 points in a season! Phil scored 717 goals and 873 assists in 1282 games. Phil was known as a leader and the engine that refused to let Canada lose. Phil was known for refusing a line change in the third period before assisting on a game winning goal scored by Henderson in the 1972 Summit Series. 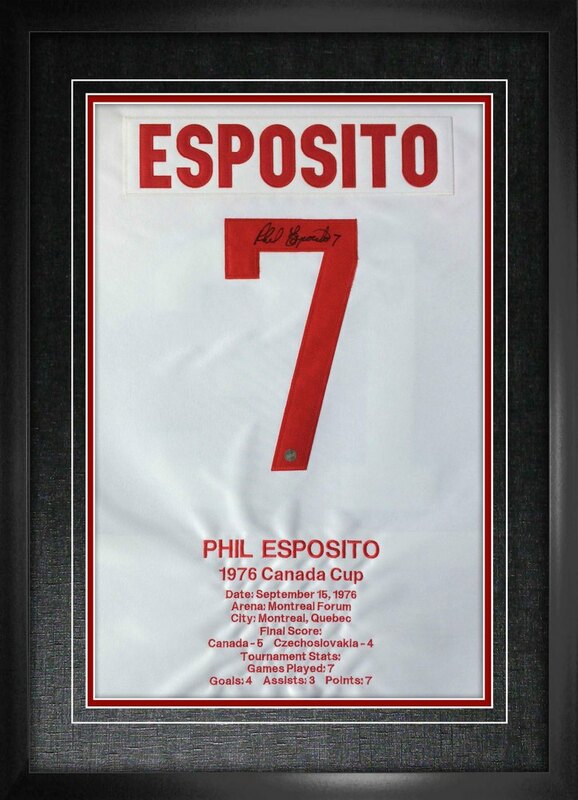 During the Canada Cup in 1976, Esposito helped lead the Canadians to victory with 7 points in 7 games. This Hockey Canada licensed product comes accompanied with a Frameworth hologram and COA to ensure the authenticity of the signature.